HAVE A smart kid with an ability to draw? Then he/she must enter the Toyota Dream Car Art Contest that is entering its 13th edition this year. The competition is only open to SA girls and boys (younger the age 15). It is also open to world contestants. 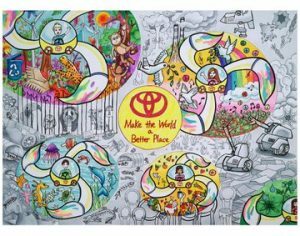 It was visualised by Toyota President and CEO Akio Toyoda, who wanted to create a platform to teach children to use the power of dreams and imagination as well as stimulate their interest in cars. The National Contest is held in each participating countries until March 2019. Entries close 1 March 2019.